Welcome to Hillcrest Apartments in the gorgeous city of Sault Ste. Marie. 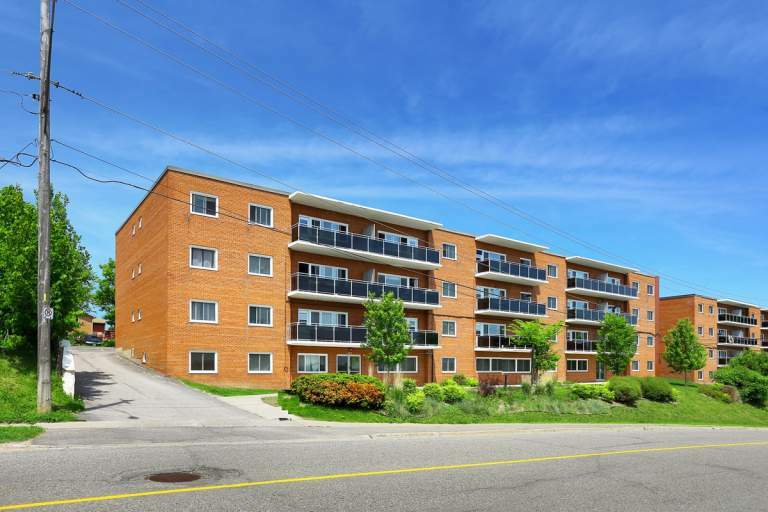 These four-storey apartment buildings are distinguished by their many sought-after amenities including upgraded common areas, new landscaping designs, and energy efficient appliances. Step into one of our spacious studio, one- or two-bedroom units and you will be delighted with desirable features. Contemporary flooring, fresh paint, private balconies and a laundry room on each floor for your convenience. Hillcrest Apartment residents, also save money with our eco-friendly lighting fixtures and water-saving toilets. At Hillcrest Apartments you don't have to compromise on location. Just minutes away residents will find their most desired amenities, such as grocery stores, coffee shops, shopping centres, bank facilities and more. Don't feel like cooking? There are a wide variety of delicious dining options for you to choose from, all within close range of your centrally located building. Try our Neighbourhood Explorer tool and start planning out your daily routine today! Enjoy the beautiful city of Sault Ste. Marie and all it has to offer, with Hillcrest Apartments as your northern retreat in a relaxed, welcoming community.